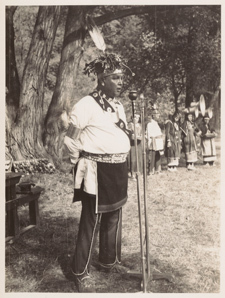 A Seneca artist and performer, Cornplanter (1889-1957) corresponded with Joseph Keppler for much of his life, starting as a young boy in 1899. He also served as an informant to scholars like William Fenton, and Seneca anthropologist Arthur C. Parker. Impatient with simply narrating information about Iroquois ceremonies, religion, and mythology to others, he determined to write his own book of legends. 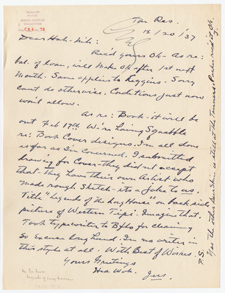 He cast his book as a series of letters to Mrs. Walter A. Hendricks, who also found him a publisher. He complains in this letter to Keppler that this publisher planned to use western tipis as the background for the cover of “Legends of the Longhouse.” Cornplanter lost the argument. Stylized tipis adorn the dust jacket of his 1938 book. 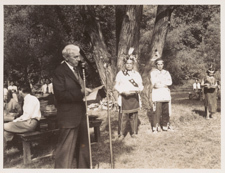 The photographs show Cornplanter and Joseph Keppler at Elison Park in Rochester, New York on September 25, 1937, participating in a ceremony that awarded the Seneca Silver Star to Keppler for his years of service.